Get Free Shipping on a Schwinn® 230 Recumbent Bike. Free shipping applies only to the Schwinn® 230 Recumbent Bike. Offer only valid within the 48 contiguous states of the continental U.S. We regret we cannot ship to P.O. Boxes, APO/FPO addresses, U.S. territories, Canada or international destinations. Offer not available with any other offer and is subject to availability and may change at any time. Price is subject to change. Shipping discount applies to Standard Shipping option only. Offer is valid once to a customer and excludes previously placed orders. Offer is not valid at retail stores or outlets. Offer valid for a limited time only. Count on Schwinn Fitness…for the good life. Designed with a solid build, comfortable ride and user-friendly features, the 230 Recumbent Bike delivers the exceptional value you’ve come to expect from Schwinn. 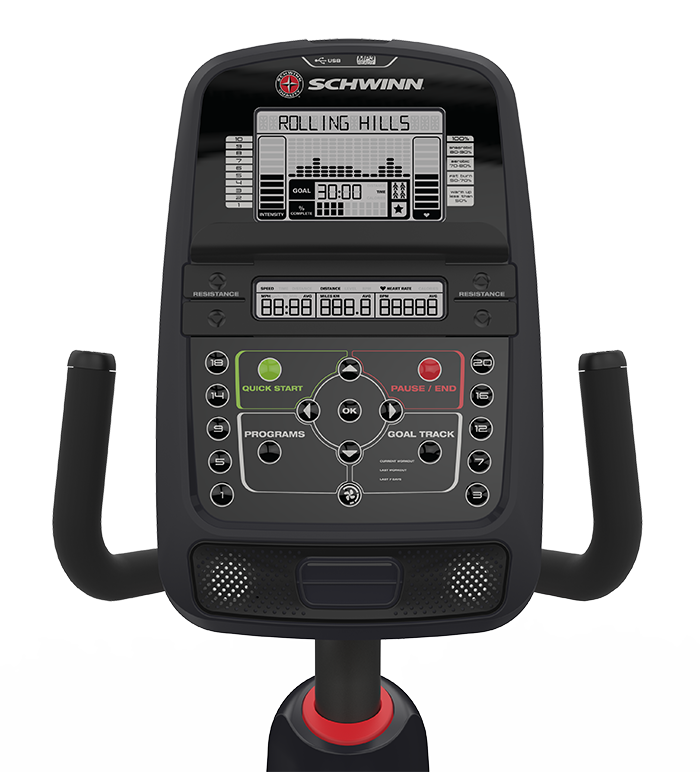 And with dozens of workout programs, easy-to-read displays and intuitive goal tracking, the Schwinn 230 puts a higher level of fitness well within your reach. Track time, distance and calorie goals and compare to previous workouts. Seat rail slider system with easy adjust lever customizes the fit for each user. Ergonomically positioned padded handlebars with integrated contact heart rate sensors. 20 levels of computer controlled resistance for a wide range of workout intensity options. 22 preset exercise programs (9 profile; 8 heart rate control (4 Beginner, 4 Advanced); 2 custom user defined; 2 fitness test (1 Beginner, 1 Advanced); 1 quick start and additional features. 2 user profiles for multiple user set-up. Water bottle holder may be mounted on either the left or right side of the bike.